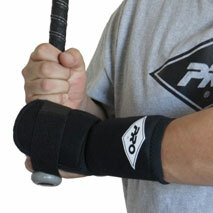 Revised design for additional longevity and durability, the PRO 773 protects the back of the hand and wrist while at bat. Constructed from 1.5mm neoprene with nylon on both sides the guard slides easily on the forearm. A thin stretch loop strap wraps around securing the guard to the back of the hand. Two separate pads comprised of a combination of stiff EVA foam and slow rebound foam provides protection to the back of the hand and the lower forearm and wrist. Access to the pads is easy should the user wish to remove one or to facilitate easy cleaning. Available in black, Adult or Youth size. Fits right or left arm.